Too Poppy: Let's Do It! Let's Love! Let's Do It! Let's Love! 4) "Flying" is another rocker with lots of guitar, again a little raw, just like I like it. His voice is rough and edgy in this one as well. "Baby I've been flying, I don't know what's happened inside, not even trying, I'm flying, I wanna be Christ, I don't know..." Mind you, I'm just picking what lyrics I can out by listening, I don't have them written out. 6) "Let's Love" is GRAND! The guitar work is killer, it's a rocking song, and it's rich and full. Lots of delay and overlay on the vocals and plenty of noise. "We've done enough wishing and we've done enough hoping...let's do it! let's love" - absolutely stellar. Probably my second fave on the album. 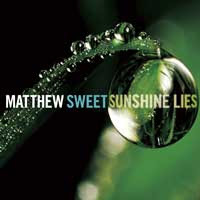 10) "Sunrise Eyes" starts with some screaming guitars and Matthew shouting, "Sit down!" This is TOTAL ROCK CANDY! It's has "yeah yeah yeahs in it and chunky guitar. Definitely a "play it loud" kind of tune. Love it. "I need a way to tell you, yeah yeah yeah, I'm in love with you, with you, right now, looking into your eyes, looking into your eyes, I feel the sunrise." I hate to talk about it much as I'm no critic and I don't want to get people believing it's something it's not because of the way I try to describe it. There you go. Thanks for letting us share, Linda. It sounds truly awesome. I think we will do another record - I think it might happen one day. I love hanging out with Matthew. He’s like a big kid and he’s fun to be around. Excellent all around. Download The Thorns debut album here. If you're broke, at least download I Can't Remember. Awesome tune. So, I guess that means the one song he's had up on his myspace page for a while didn't even make the final cut, that being "Badass". Oh well, didn't really like it that much anyway. Still excited for the album, though. Yeah, it figures. Agreed, though, I was not a big fan of it so it's better left off. No filler = more killer! I was actually kind of sad Badass didn't make the cut. I really like it! Oh well! I'm sure the album will be awesome! Also, The prospect of a new Thorns record is VERY exciting! Matthew's MySpace page has three tracks from the album up. They're AWESOME!